If you would like to order a ticket simple copy the URL and paste it into the order form I will take care of the rest. You can have the ticket sent to you or pick it up in Seoul while you are here^^ For more general information about tickets and events in Korea check out the How to Buy Tickets in Korea guide. From the main page click the left menu option 콘서트 concerts. Search the name of the group or performer in Korean. 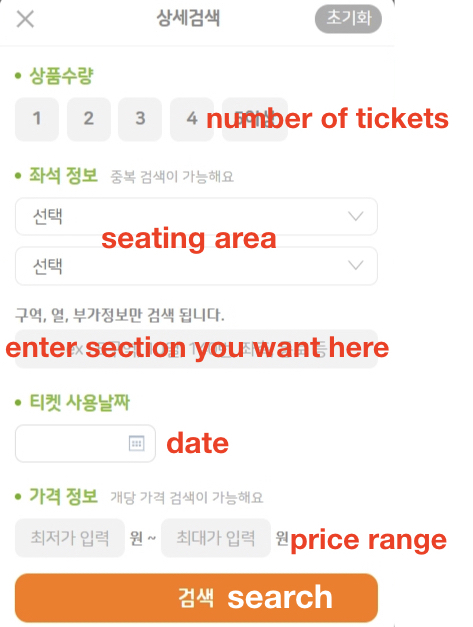 Once you click the concert you are interested in, above the ticket listings on the right site there is a button called 필터 filter. This will bring up the pop up pictured below and allow to enter search criteria such a date, price, sections, number of tickets etc. 3. Search. I usually search date and section and that’s it. The tickets are listed from least expensive to most expensive. For standing sections lower ticket numbers enter the area first so they are more expensive. Exact ticket numbers are not listed. 70x or 70n means 700 something, not ticket #70. 24x means 240 something, and 80번대 means 80 something not exactly #80. 4. Request the ticket on our order form here.